Journal of the American Society of Psychosomatic Dentistry and medicine. A wealth of anecdotal and and clinical material exists which lends support to the possibility of extrasensory effects occurring in the dream phase of the sleep-wakefulness cycle (e.g., D'Alessandro, 1968; MacKenzie, 1965). However, an experimental approach to the question of the paranormal dream did not become possible until the advent of psychophysiological monitoring techniques. It was discovered that subjects awakened from periods of rapid eye movement (REM) sleep were frequently able to recall vivid visual dream episodes (Aserinsky & Kleitman, 1953). Thus, for the first time, a telepathic sender (or "agent") could program a target stimulus in any desired relationship to the recurrent episodes of REM activity during the course of a nighttime experiment. * the study was supported by grants from the Mary ReynoldsBabcock Foundation, Winston- Salem, N.C., the Irving E. Laucks Foundation, Santa Barbara, Cal., and the W. Clement and Jesse V. Stone Foundation, Chicago, Ill. It was first reported as part of the senior author's Invited Address, "The Use of Convergent Operations in Bio-Information Research," Institute of Psychology, Academy of Pedagogical Sciences, Moscow, U.S.S.R., June 28, 1971. ** Dream Laboratory, Malmonides Medical Center, Brooklyn, N.Y. 11219. U.S.A. The authors would like to express appreciation to Ronny Mastrian, who directed the experimental procedures at the Capitol Theater; to Arthur Becker, Paul Bindler, Mildred Cabone, Wayne Champlin, Athena Drewes, and Mark Peaner, who served as experimenters at the Mainmanides Dream Laboratory; to Ron Suarez, who supervised target selection; to Michael Bova and David Powlison who served as judges; to the management of the Capitol Theater for their cooperation; to Jerry Garcia, who suggested the experiment; and to the other members of the Grateful Deads Mickey Hart, Bill Kreutzmann, Phil Lesh, Ron McKeman, and Bob Weir. Statistically significant results (Ullman & Krippner, 1970), but an analysis of 83 pilot session completed between 1964 and 1969 produced data confirming the telepathy hypothesis at the .00001 level (Ullman, Krippner, & Honorton, 1970). Art prints have been used as stimuli for these experiments because of their ability to maintain the attention of individuals and to move them emotionally, esthetically, and intellectually. The art prints selected contain archetypal themes, imply strong emotional feeling, and utilize vivid color-the elements often found to characterize those paranormal dreams which are reported anecdotally and clinically. the song, "If You Want to be a Bird," while the film and slides were shown to the audience. There were five volunteer subjects for the study, all located in a 100-mile radius from the concert location in Manhattan. All subjects were told the location of the concert and were directed to record their images at 12:00 midnight, at which time the target material was exposed. One subject, Helen A., had the impression of "something mythological, like a Griffin or a Phoenix, or something." A second subject, Michael B., reported the image of "a snake." Doug C., the third subject , reported a recurring image of "grapes." Stanley K., subject number four, visualized "an embryo in flames, growing into a tree." Richie Havens, the celebrated American singer and recording artist, was the fifth subject. Upon closing his eyes at the appointed time, Mr. Havens' image and that of Helen A. represented direct correspondences with the target material, with the report of Stanley K. representing a partial correspondence. In reviewing the methodology used in this pilot session, it was decided to make the directions to the audience more explicit and to tell them the location of at least one subject --something not done in the pilot session--during the next attempt to use multiple telepathy agents. It was also decided to randomly select the target material just before it was revealed to the audience so as to eliminate the possibility of sensory leakage through conscious or unconscious collusion and fraud. For the six-night study, an attempt was made to use a large number of telepathic agents in a situation which would involve some of the emotional intensity which characterizes spontaneous instances of telepathic transmission. The entire audience attending concerts by The Grateful Dead, rock-and-roll musical group, was instructed to telepathically transmit an art print which was randomly selected just before it was projected on a screen above the musical group while they were performing. One of the laboratory staff members (R.S.) selected 14 2" by 2" slides of art prints which he felt satisfied the requirements previously stated. He randomly selected two of these slides and gave them to an experimenter (R.M.) the night of each concert. The slides were sealed in separate opaque envelopes. The staff member marked one envelope "heads" and the other "tails" At 11:30 P.M. each night, the experimenter tossed a coin and noted whether it read "heads" or "tails." This determined which envelope he opened and which slide he projected for the audience. Such art prints were utilized as "A Synthetic Emblematic Cross" and "The Seven Spinal Chakras," both by the Armenian artist Scralian, and "The Castle of The Pyrenees" and "Philosophy in the Bouldoir," both by the French artist Magritte. Duplicate copies of the slides were put aside for later evaluation by outside judges. 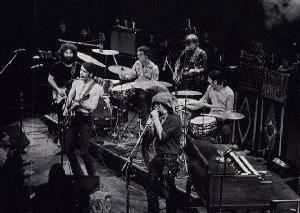 The six concerts involved in this experiment were held at the Capitol Theater in Port Chester, N.Y., approximately 45 miles from the Dream Laboratory. Music from a Grateful Dead album had figured prominently in a previous ESP experiment at the laboratory (Krippner, 1971). Back in the days of the Acid Tests, we were looking for a name. We'd abandoned The Warlocks, it didn't fit anymore. One day we were all over at Phil's house smoking DMT. He had a big Oxford dictionary, opened it, and there was "grateful dead," those words juxtaposed. Early in their careers, each member of the group tried LSD. In1966, the group lived in Los Angeles for three months with Augustus Owsley Stanley III, the legendary supplier of the black market's high-est quality LSD. They returned to San Francisco in mid 1966 and lived as a psychedelic musical commune for a period of time, releasing (between 1967 and 1969) several records, parts of which were consciously designed to be played while the listener is in a altered state of consciousness. In 1967, following a raid by narcotics officers, the group abandoned its San Francisco commune and now live in separate houses in the country. The group's basic sound can be described as hard rock, rhythm-and-blues which also includes electronic, classical, country-and-western, Indian, "accidental" music, jazz, and folk music. Members of the group often attribute their open attitude toward various musical forms to psychedelic experience which "does away with old forms" allowing them to create "music beyond idiom." (Lydon, 1969.) Bob Weir, the group's youngest member, has not taken LSD in large doses for four years. He does not regret his drug experiences but stated (in an interview with the author), "I think that I would have ended up at the same place even without acid." The eclectic nature of the group and its music is also to be found among its performers. Mickey Hart, for example, an Air Force veteran and jazz drummer, recalled that he was "stoned out of my mind" when he first heard the group in 1967 (Tawney, 1969). He jammed twice with the other drummer and asked Jerry Garcia if he could sit in with the group during an appearance at San Fran- cisco's Straight Theater. Hart says, "We finished and the crowd went wild, Jerry came over and embraced me, and I embraced him, and its been like that ever since." Hart learned to play in Oriental meters. He now refers to the basic rock four-four beat as a "box" and has devised highly complicated patterns which he and Bill Kreutzman, the other drummer, synchronize--sometimes by hypnotically-induced altered states of consciousness. The group has developed a style often described as "black santanic," personifying a "Horror comic monster who, besides being green and slimy, happens also to have seven different heads, a 190 IQ, countless decibels of liquid fire noise, communication, and is coming right down to where you are to gobble you up." (Lydon,1969.) This image stems, in large part, from the group's association, from its earliest days, with LSD, marijuana, and psychedelic experience. Two "psychic sensitives," Malcolm Bessent and Felicia Parise, served as subjects for this study. Both had participated in previous studies of extra-sensory effects at the Dream Laboratory (e.g., Krip-pner, 1970). Mr. Bessent's dreams were monitored by standard psychophysiological techniques at the laboratory. Miss Parise slept at her apartment; she was telephoned from time to time during the night and asked for dream recall. Further, the audience at the Capitol Theater was told about Mr. bessent's participation in the experiment, but was not informed as to Miss Parise. The difference in treatment between the two subjects was arranged so as to explore the influence of intentionality by the agents. If it is important in telepathy experiments that the agents know who they are transmitting messages to one would have expected Mr. Bessent to do better than Miss Parise. However, if telepathy basically involves a "reaching out" for the target picture on the part of the subject, with little or no effort needed on the part of the agent, one would have expected Miss Parise to do as well as Mr. Bessent. Mr. Bessent arrived at the Dream Laboratory at approximately 10:00 P.M. each evening so as to be asleep at 11:30 p.m. when the audience was exposed to the target material. Miss Parise retired at about the same time. 3. TRY USING YOUR ESP TO "SEND" THIS PICTURE TO MALCOLM BESSENT. 4. HE WILL TRY TO DREAM ABOUT THE PICTURE. TRY TO "SEND' IT TO HIM. 5. MALCOLM BESSENT IS NOW AT THE MAIMONIDES DREAM LABORATORY IN BROOKLYN. 6. At this point, a randomly selected art print was projected on the screen. The Grateful Dead continued to play while the slides were projected. Between numbers, they occasionally made comments regarding the experiment and the slides, thus drawing the audience's attention specifically to the material. The art print was projected for 15 minutes. As there was no "light show" o any of the six nights, the experimental material served as the only projected visual stimulus during the concert. Mr. Bessent's sleep was monitored by standard electroencephalofram-electro-oculogram techniques. Following about 10 minutes of REM activity, Mr.Bessent was awakened asked for his dream report, and told to go back to sleep. In the morning, Mr. Bessent was asked to give associations to each dream. Mr. bessent's dream reports were recorded on tape, sent to at typist, and subsequently transcribed. Miss Parise was telephoned at approximately 90-minute intervals during the night. Her dream reports were written down by an experimenter. The following morning, Miss Parise went over the dream reports, adding any pertinent details which had been omitted previously. She also gave associations to each of her dreams. Evaluation was accomplished by giving two judges (M.B. and D.P.) all six transcripts for each subject as well as all six art prints actually used. The judges worked independently and had no contacts with each other, with the subjects, or with the staff members who had been at the laboratory on the nights of the experiments. Each judge read the subject's transcripts and looked at the art prints. On a 100-point scale, he made a mark describing the degree of correspondence between the dreams and the art prints. When he finished, he had made a total of 36 evaluations for Mr. Bessent and another 36 for Miss Parise. The average evaluation of the two judges was computed for each pair of dream transcripts and target pictures. If coincidence, rather than ESP, had been operating, the judges' evaluation of the correct transcript-target pairs would have been higher than all other pairs one time out of six. For Miss Parise, one correct pair obtained the highest rating. In the case of Mr.Bessent, the judges gave the highest scores to the correct pairs four times out of six. This distribution produces a critical ratio of 2,449 which is statistically significant at the .0124 level in a two-tailed test. Thus, for Mr. Bessent, the ESP hypothesis is supported. Further, some support is given to the position that the agents must know who the target is to be transmitted to and where he is located for telepathy to occur. I was very interested in . . . using naturalenergy . . . I was talking to this guy who said he'd invented a way of using solar energy and he showed me this box . . . to catch the light from the sun which was all we needed to generate and store the energy . . . I was discussing with this other guy a number of other areas of communication and we were exchanging ideas on the whole thing . . . He was suspended in mid-air or something . . . I was thinking about rocket ships . . . I'm remembering a dream I had . . . about an energy box and . . . a spinal column. On several other nights, Mr. Bessent's dream reports demonstrated a degree of correspondence with the target pictures. For example, on February 20, 1971, Magritte's surrealistic painting, "Philosophy in the Boudoir," was randomly selected; it portrays a headless woman dressed in a transparent gown. Mr. Bessent dreamed about "a little girl's doll" and a "fantasy" about a "stop watch on a card around my neck." Mr. Bessent's results were statistically significant and Miss Parise's were not; several possibilities for this difference should be considered. Of importance is the fact that on each of six nights the 2,000 members of the concert audience were exposed to Mr. Bessent's name and were instructed to "send" the image of the target picture to the Mainmonides Dream Laboratory in Brooklyn. Miss Parise's name was not exposed to the audience and she was not located at the Dream Laboratory. Thus, it is likely that the results of this experiment demonstrate the necessity of agent orientation; in other words, the telepathic "sender" must know the purpose of the experiment in order to make a contribution to the paranormal effect.